This blog focused on drawing from many diverse sources in order to inspire the art of Crappie Fishing. It is the canvas where paint strokes will be made and over time a masterpiece will certainly be revealed. Along the way, the objective is always to share information and resources that'll be beneficial to anyone who loves Crappie Fishing. Crappie (pomoxis annularis & pomoxis nigromaculatus) is a species of fish indigenous to United states. There are two types of species of crappie, white crappie (pomoxis annularis) and black crappie (pomoxis nigromaculatus). They stay in freshwater and are one of the more popular game fish among anglers. Their habitat usually consists of water which can be moderately acidic and highly vegetated. When they're juveniles they feed mostly on prey that is microscopic, for example, cyclops, cladocera, and daphnia and once mature they'll feed on aquatic insects, minnows, and fish fingerlings of other species. Crappie certainly is a schooling fish and it'll school with other different types of pan fish. They like underwater structures like fallen trees, weed bends and other structures that might be submerged. Generally, throughout the day crappie are likely to stay deep underwater and just shift to shore when feeding, mostly at dawn or dusk. However, during their spawning period they usually are found in shallow water in large concentrations. They do not get into any semi-hibernation during the winter, making them a major target of anglers that are ice fishing. Crappies, both black and white could have a color variance that may be affected by their habitat, age as well as the colors of the local breeding population. Use a different presentation. That lessens the pace of, speed up, twitch, or alter your retrieve in some way. Get a different color lure. Crappie is especially renowned for being color picky. Simply switching from a green jig into a yellow it's possible to result in the difference between a couple of bites and a stringer of slabs. Change baits completely.If you are using minnows all day and also have caught no fish, try switching to some small spinner or jig. The fish could want something with more or less action than your bait produces, and that means you must experiment until you find what they want. 1. 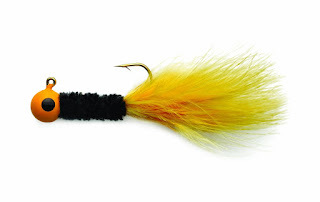 Maribou Jigs-These is the small jigs which have little furry bodies and puffy, feathery tails. They are available in many sizes and a lot of colors,are extremely durable and are generally fairly cheap to order (I catch them available for sale at Wal-Mart for $.25 for the four-pack). They can also often be made at home with some yarn and pipe cleaners. These jigs are best for finesse fishing picky crappie, vertical jigging over the structure, or suspending under a bobber. I prefer a 1/16 or 1/32 oz. jig. 2. Curly-tail Grubs- These are the soft plastic baits that have curly tails on the back that produce lots of action when jigged or retrieved steadily. They come in many sizes, but I like a 1 1/2"- 2 1/2" grub for crappie. Rig them with a 1/8- 1/64 oz. jig head, based on conditions and preference. 3. Spinners-These are generally one of the best lures to utilize when crappie fishing. It is because they are really very versatile, effective, and fairly weedless. When I say versatile, I am talking about you never know just what you are going to catch on them. I've caught 16" bass, 9" bluegill, 21" catfish, and 13" pike while crappie fishing with a spinner. The spinners I prefer and have the best results with are the smallest sized ones I'm able to find. The 1/16 oz. Beetle Spin is a perfect size. Wal-Mart carries several sizes of the individual spinners, however, the absolute smallest ones work best. I've also found that gold blades seem to produce better strikes compared to normal silver. I highly recommend trying the tiny gold blades when you are on the water. Jigs are probably the most popular artificial for taking crappie. There are huge amounts of styles and colors available. Jigs feature bodies of rubber, plastic, marabou, hair, rubber bands, floss, tinsel, chenille, and innumerable other materials. 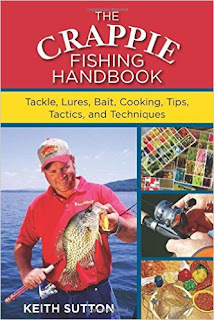 You will find jigs with curly tails, ripple tails, broad tails and triple tails; jigs with lead heads, floating heads, diving heads and standing heads; jigs with spinners and without spinners; weedless jigs and those that aren't; and many types of this in the colors of the rainbow and every combination imaginable. To be ready for any situation, carry several jig styles, colors, and weights. 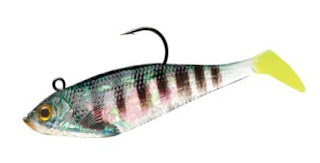 Most crappie jigs range from around 1/80th to the 1/8th ounce, occasionally around 1/4 ounce. I stock my box with four primary sizes: 1/64, 1/32, 1/16-and 1/8-ounce. 90 % of them are 1/32-ounce because that is the size I've found most efficient in most situations. However, occasionally and places where smaller or larger jigs prove more productive. The best jig for you personally is the one in which you develop the most confidence. Try several varieties, and most likely, one will soon become your favorite. My own favorites are tube and curly tail jigs, simply because I'm able to quickly change colors and never have to cut off and re-tie the jighead. Speed and simplicity are essential when trying to ascertain a pattern on crappie. Thou shalt use something chartreuse. Top winning tournament angler Mike Walters claims that regarding all artificial colors on the market, chartreuse seems to be usually the one crappie prefer most. From jig skirts to jig heads to hooks and lures, chartreuse is and constantly is a winning color. “The old joke is - it doesn’t matter what color jigs you choose for crappie fishing, so long as it’s chartreuse,” said Walters. Thou shalt maintain your baits higher than the fish. Pickwick guide and crappie fishing promoter Brad Whitehead reminds anglers that due to shape and positioning of a crappie’s eyes, mouth, and body, crappie always feeds in an upward direction and infrequently feed down. He suggests focusing on the level of fish marked on your electronics and fish at or just above that level. Thou shalt follow the bait. B’n’M pro-staff manager and tournament angler Kent Driscoll states the obvious in claiming the ultimate way to catch fish are to fish where the fish are. The obvious way to know the location where the fish are is to follow the bait. 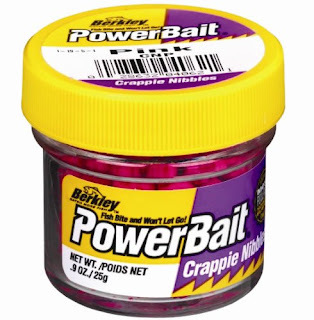 If you need the best gear for Crappie Fishing, please visit CrappieFishing.BigCartel.com for more information.